When your older dog can't run anymore - Borrow another! 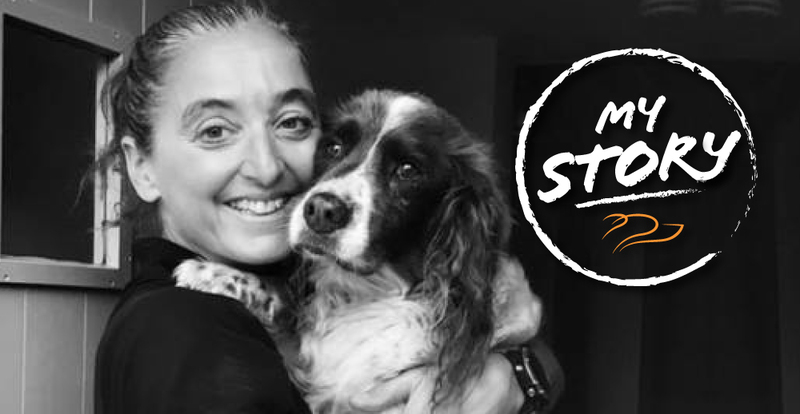 Ali has been a keen trail runner for years and as a director of a walking holiday company in North Cornwall, this enabled her and her dog Ellie to enjoy countless runs along the North Cornish coast path, shuttling their visitors to various locations. Ellie, an English Springer Spaniel, has lived with an auto immune disease since she was 6 months old and is due to celebrate her 14th birthday next month. Her fitness over the years is testament to the fact that she was out walking every day with guests and running with Ali. It kept her strong. Unfortunately, Ellie has had to retire from running and Ali was keen to continue running with a dog due to the companionship they provide and the sheer joy of being out there with our four-legged personal trainers. What better motivation is there? Ali decided to enrol in a Taster Session with her local DogFit trainer in Bude and immediately saw the benefits of the sport. This gave Ali the idea that whilst Ellie was unable to run with her, she would be able to help her friends out by taking their dogs out in a safe, fun way. This is when Gertie came on the scene. Just 2 years old, an Italian Spinone hunting dog, and already proving to be a lovely canicross partner. They run miles together along the coast paths and trails in North Cornwall and have forged a great bond. They are both enjoying this new sport together. The joy in Gertie’s face says it all really! DogFit have a network of Certified canicross trainers running classes around the UK. They help owners and their dogs, get fit and enjoy the sport in a safe, structured and fun way. You can find our DogFit trainers listed here.